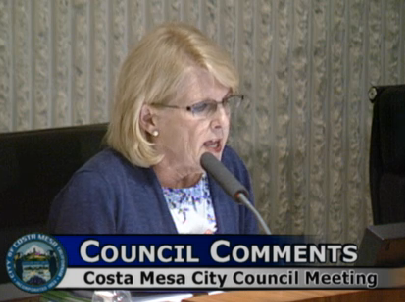 Tonight Jill Cowan, writing in the Daily Pilot, HERE, tells us that the Orange County COIN ordinance - modeled after Steve Mensinger's unproven Costa Mesa ordinance - has been given a punch in the face by the Supervisors, who refused to give it a second reading. SPITZER - "A FARCE OF TRANSARENCY"
"He said that without a requirement that supposals be made in public in addition to formal proposals, the county's ordinance as written, as well as Costa Mesa's, represent "a farce" of transparency." 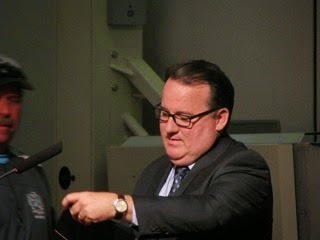 Of course, Mensinger didn't much like that, but the fact is we don't know if this ordinance is going to work at all yet! 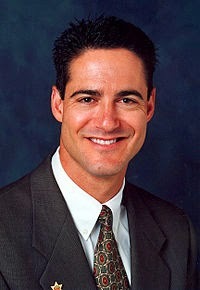 There has been no negotiation that has made it through the process, so we have no clue about its effectiveness. 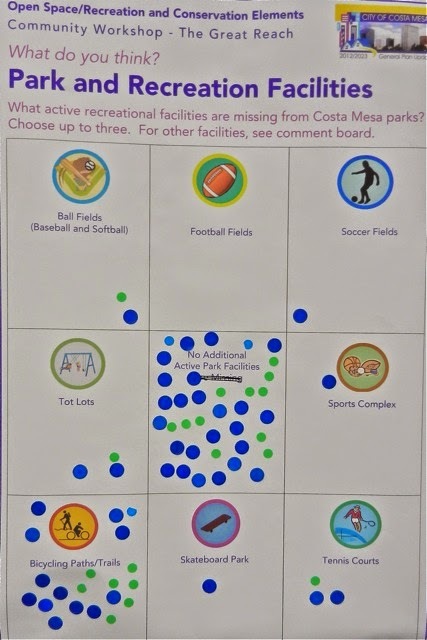 It would seem prudent for any governmental entity considering a similar scheme to wait until Costa Mesa has had at least ONE negotiation make it through the process so the effectiveness can be evaluated. We sure don't want them to emulate Costa Mesa's "Ready, Fire, Aim" method of governance, do we? The Costa Mesa Police Department issued a press release today about the arrest of one Daniel Lee Warn of Bloomington, CA who was released as part of the State's "Realignment to Post Release" program. Let's all send Governor Jerry Brown a little note thanking him for sending these criminals BACK into our communities to prey on residents AGAIN! Contact information for the governor is HERE. 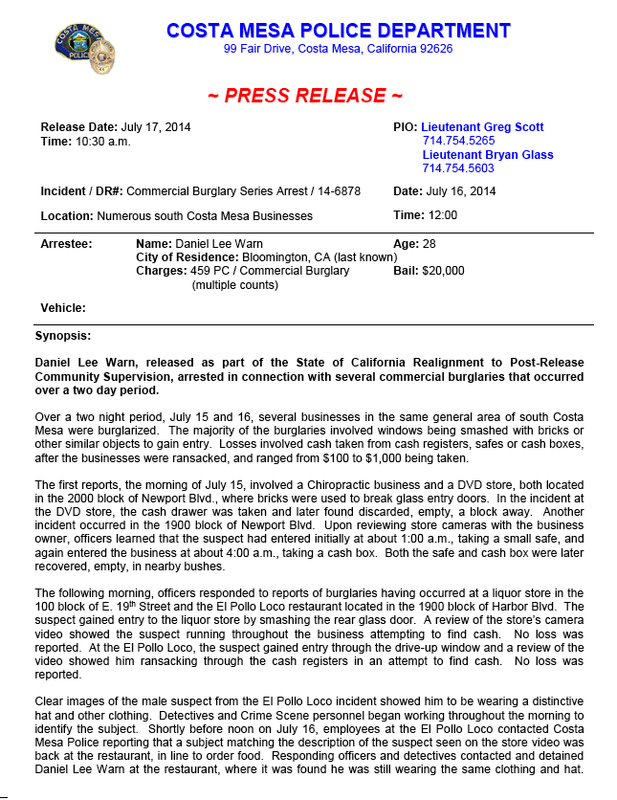 The following two images are the police report of the incident and photos of this "model citizen". Click on the images to enlarge. 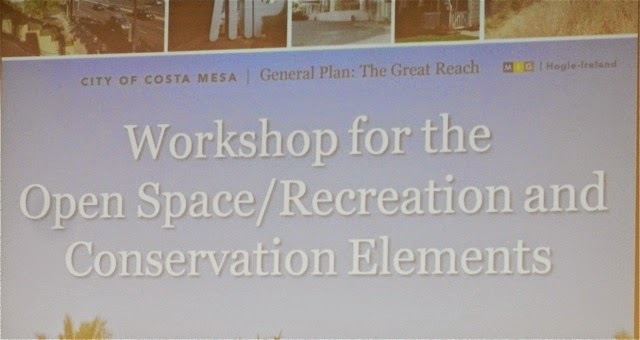 As part of the "Great Reach" series of meetings to gather information and provide community outreach during the process of updating the City of Costa Mesa General Plan - a process that has been going on for a year - last night City staff and consultants conducted a workshop for the Open Space/Recreation and Conservation elements of the General Plan at the Costa Mesa Neighborhood Community Center. The program was divided into two segments. Following a brief introduction by Gary Armstrong, Director of Development Services and Deputy Chief Executive Officer, the four dozen or so attendees were invited to circulate around the room and observe the various exhibits and, if interested in doing so, to indicate preferences in the options provided by placing stickers in the appropriate spots. 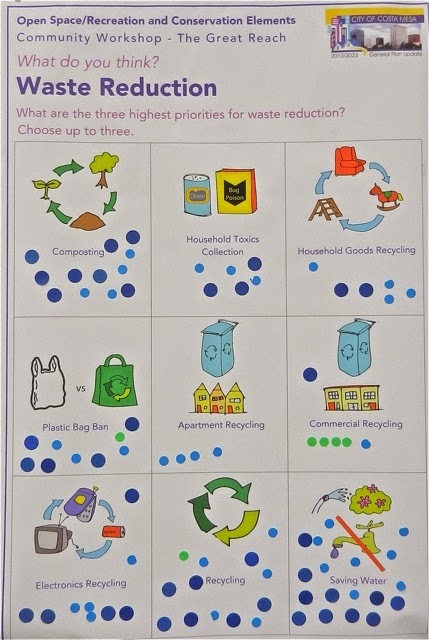 I've provided images of the results of that activity for your information. Click on each to enlarge them. Then a more formal program commenced with an extensive question and answer period. 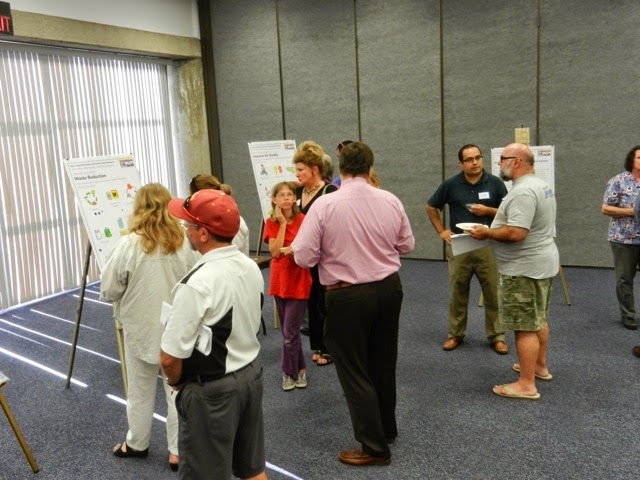 Armstrong, Public Services Director Ernesto Munoz and consultant Laura Stetson guided the discussions. 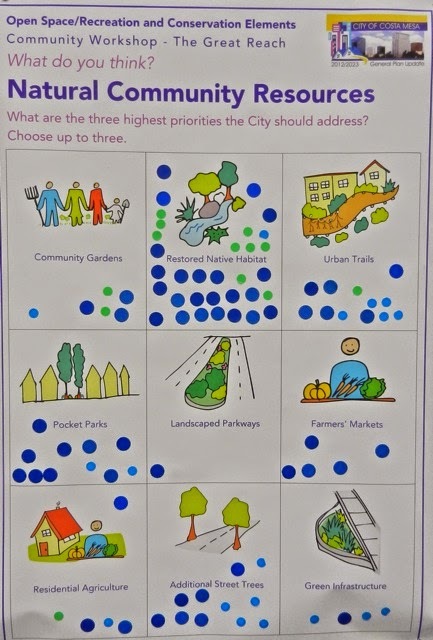 I thought it was informative that many, if not most, of the questions seemed to revolve around Fairview Park. 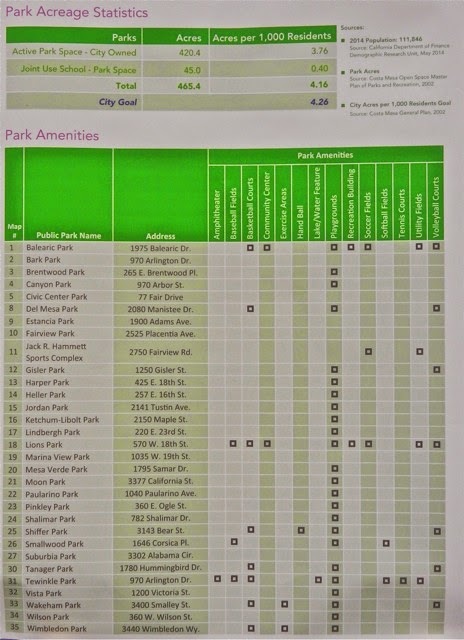 That's not unexpected, since there is a parallel activity - the Fairview Park Citizen's Advisory Committee - currently underway in which suggestions for the future of that park are being fleshed-out. In fact, Stetson had to re-direct the discussion to cover broader issues before wrapping the meeting up with more Fairview Park questions. The meeting lasted until 8:30 and, when I left shortly thereafter, staff and consultants were still answering questions from concerned residents. Although this meeting was well-advertised, I was surprised that so few young people attended. I thought this might be a chance for concerned residents to speak up about what we're told is a severe shortage of playing fields in our city. Instead, most of the attendees were older - some even as old as me! And, ironically, one of the few young people who attended - two, I believe - asked a couple questions about keeping Fairview Park natural. 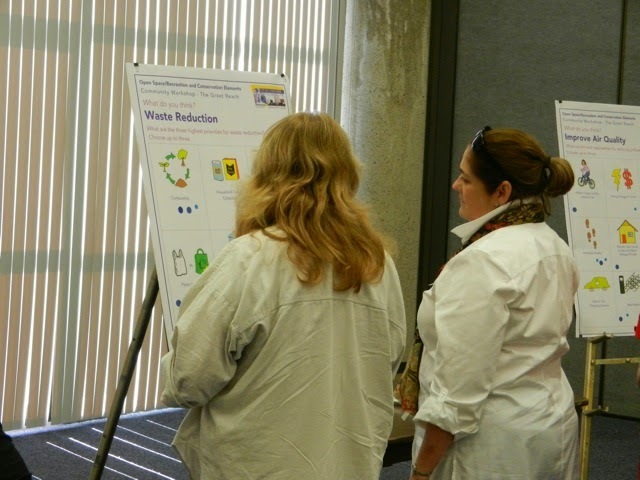 The ratio of City staff and consultants to attendees was about 3 to 1 - three attendees per staff/consultant. That made for some very good conversations during the early segment. There were many of the "usual suspects" in attendance - those folks who take time out of busy lives to do their homework, attend meetings and express their informed views on important issues. Attendees included: Councilwoman Wendy Leece; Council candidates and frequent attendees to most important city meetings, Harold Weitzberg and Jay Humphrey; Fairview Park Citizens Advisory Committee members Anna Vrska and Dennis Popp; Estancia High School Principal Kirk Bauermeister, who sat quietly and paid close attention to the program; Cindy Black and Kim Hendricks, regulars at the Fairview Committee meetings; Eastsider Beth Refakes, who also tries to make every important meeting and participate in the process; George Sakioka, a major landowner in the north part of town, participated; Parks and Recreation Commission Chairman Byron de Arakal hovered in the background, absorbing the comments of the public and staff; Commissioner Robert Graham, an ardent Fairview Park defender. However, there were many new faces - folks who have attended very few, if any, meetings in the past. They are concerned citizens, eager to get information and provide their views - just what this kind of outreach is intended to accomplish. 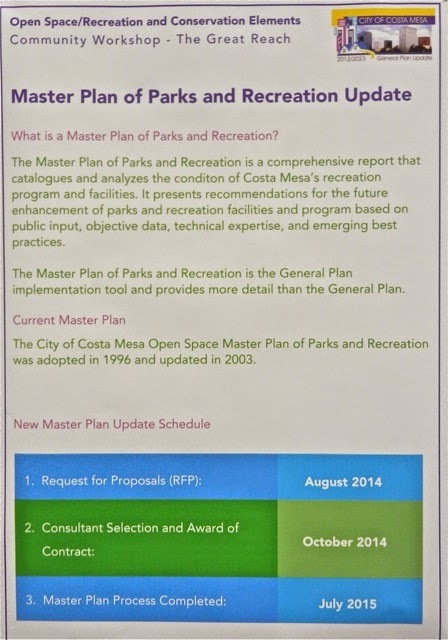 Part of the presentation included a discussion of the pending updating of the Master Plan of Parks and Recreation. 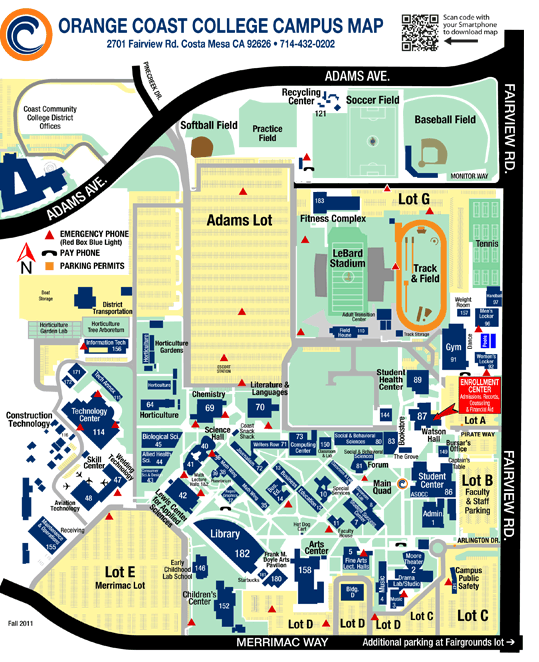 The image below explains some of that information and provides the timetable for completion of that project. 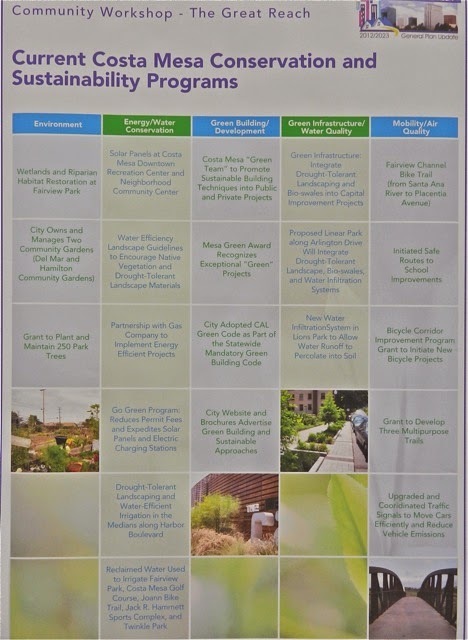 According to staff, the results of the process the Fairview Committee is undertaking will become part of the process of the Master Plan update. According to the staff, the next General Plan meeting will take place August 27th, and will be announced as that date approaches. We'll let you know here, too. In the meantime, the next meeting of the Fairview Park Citizens Advisory Committee will be held on August 6th at the Neighborhood Community Center beginning at 6:00 p.m. This one, and the next one right after Labor Day, promise to be action-packed. 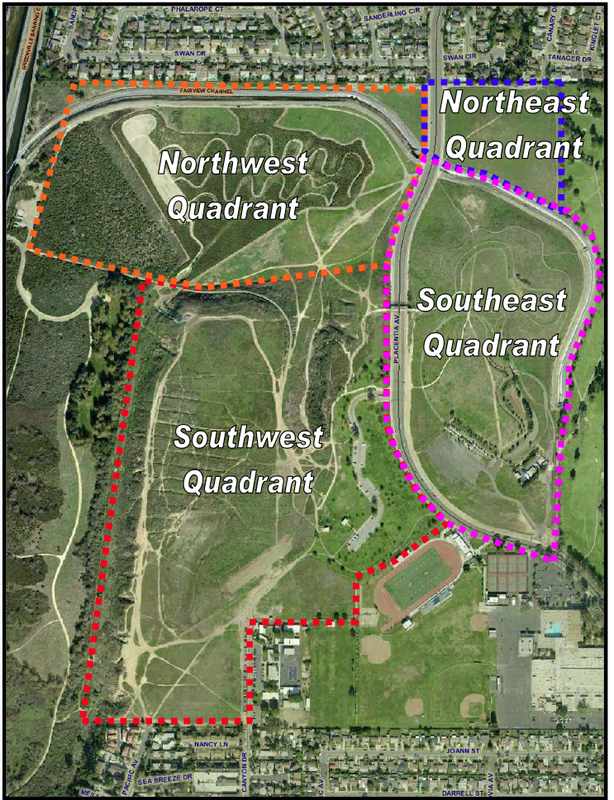 The committee recommendations for the future of the Southeast Quadrant of the park - where the large parking lot and all the Orange County Model Engineers facilities are located - will be discussed. This is the segment the "we need more playing fields" contingent of the committee have been waiting for. I fully expect the meeting to be attended by representatives of organized youth sports, on hand to plead their case, as well as park protectors to offer a counterpoint. 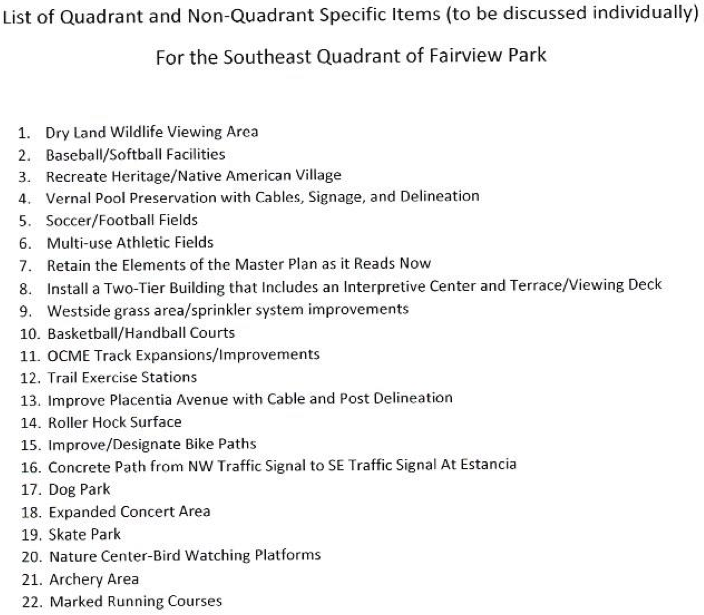 If you care at all about the future of Fairview Park I suggest you attend the next couple meetings and voice your opinion. 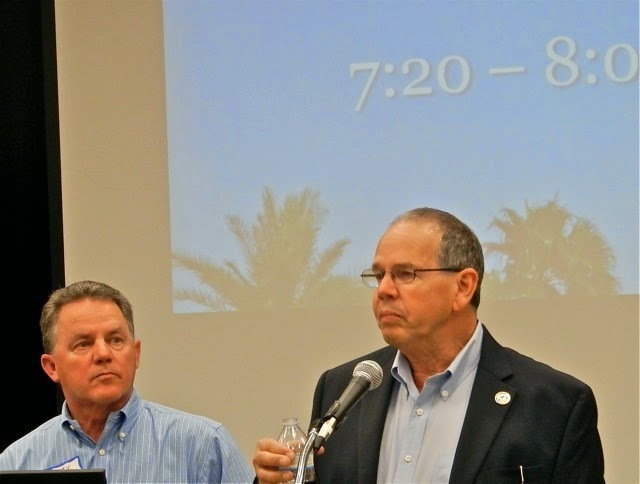 The final meeting of the Costa Mesa City Council in July last night was full of surprises, not the least of which was the early end time, but we'll get to that later. You can read the agenda HERE and watch the video of the meeting HERE. 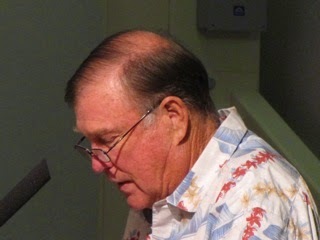 Mayor Jim Righeimer led the Pledge of Allegiance. It always amuses me when he says, "Please repeat after me" when he means "Please say with me". If we did as he asked we'd wait until he finished his pledge, then repeat it. 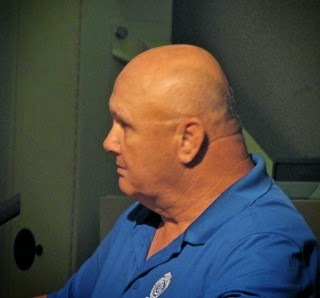 He then asked a question of contract City Attorney Tom Duarte about anything to report out of their hour-long Closed Session, which included two negotiation items and one potential litigation item. 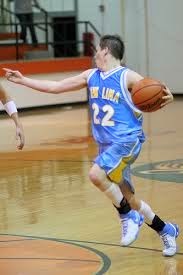 He had none, which is disappointing, since the COIN ordinance requires there to be disclosure about offers, etc. More on a related matter in a minute. 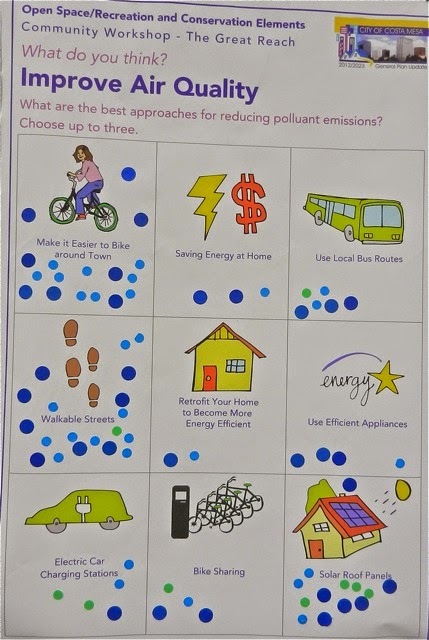 Presentations included a reminder from Kelly Vucinic of the Costa Mesa Police Department of the National Night Out program, which is scheduled - again - the same time as a City Council meeting, on August 5th. Then presentations were made by the mayor to both the Costa Mesa National and American Little League Teams, complementing them for their seasons. He seems to revel in these kind of things - shiny objects to distract us from the serious issues to come later. He jokes, mispronounces names and has a great old time, getting photographed with kids too young to know any better. During Public Comments - there were only 10 this time, so nobody had to wait until the end to speak - there were some predictable speakers and some provocative ones. Al Melone, a recently-announced candidate for City Council in November, was first at bat and - as usual - he talked about the travails of the Costa Mesa Dog Park. 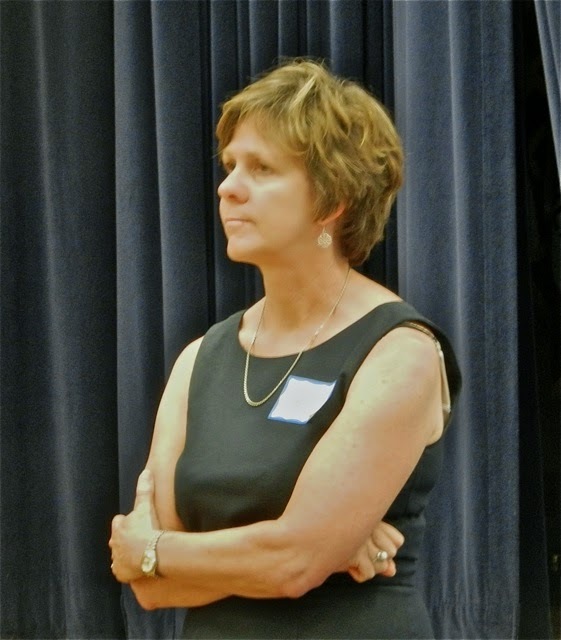 Next came Sue Lester, who addressed the multiple petitions being circulated to place Medical Marijuana on the ballot in November. She also mentioned the initiative that Gary Monahan had Duarte draft. And, she mentioned that Planning Commission Chairman Jim Fitzpatrick was addressing a local City Attorney group on Thursday on the subject, and wondered if he was doing that as a private citizen or a member of the Planning Commission. She opined that it was unusual for this attorney group to hear from the public on issues. - I don't know how factual that is, but the very fact that he attended a prior meeting and asked to be included in Thursday's agenda to discuss Medical Marijuana is interesting. As a sidebar, shortly after her presentation Fitzpatrick showed up at the council meeting and just sat there like a lump. We don't know if he intended to confront Lester later, as he has done with other residents in the past. 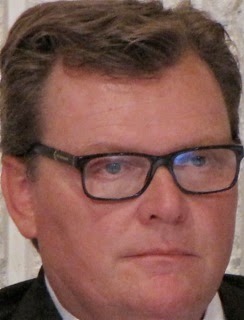 James Bridges questioned the process by which members are selected for city committees, since he has applied to several and been rejected every time. On the positive side, at least he got to speak this time. Wendy Leece used him as an example of the oppressive, exclusionary commenting policy imposed by Righeimer in a Daily Pilot commentary HERE. Cindy Brenneman spoke about the successful First Friday Roadshow series, the Kaboom playground event last weekend and the need for an Ethics policy. Parks and Recreation Commissioner Bob Graham worried about the stability of the Fairview Park bluffs in the event of an El Nino later this year. Tea Party Tom Pollitt, recent failed candidate for a seat on the Orange County Board of Education, whined about nasty comments about candidates on Facebook and other blogs, giving us his best Rodney King impression. He then encouraged everyone to become familiar with the evils of the Common Core programs. Spencer (somebody) from a new business in town - BoxFly - took his three minutes to introduce himself and his services. Chuck Perry, long, long, long time resident and buddy of Mayor Pro Tem Mensinger, stepped up and complimented the council for the nice pavement around town, among other things. Activist and volunteer Teresa Drain opined, with facts to back it up, that there needs to be an independent forensic audit of the 60th Anniversary fiasco, citing the involvement of Roland Barrera - accused in a Ponzi scheme. 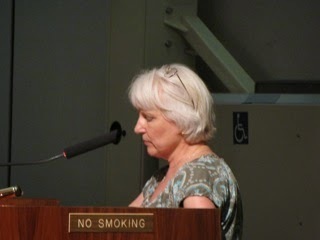 Then she echoed her observations from the Planning Commission meeting the night before in which she correctly observed that Mensinger had violated our Municipal Code by giving direction to city staff regarding the placement of monument signs in the approach to the College Park section of town adjacent to the controversial automobile dealership. Robin Leffler observed the wheeling and dealing way the city is apparently now doing business, with independent "backroom" deals by council members and developers in which important items like shade encroachment on neighbors, density and other issues get ignored. As he led off this segment Righeimer talked about the Kaboom event, Westside development and Medical Marijuana. He said he thinks Medical Marijuana should be dispensed at Rite Aid or Walgreens, but that if the initiatives make it through the process he will "do everything I can to put it on the ballot". I guess that means he's against dispensaries but will follow the law. Interesting... I guess he gets to pick and choose which laws he will follow, huh? Mensinger was up next and among the things he spoke about was the need to seek funding for important projects around the city, citing what he perceives as the failure of previous councils to do so. He specifically mentioned "the mayor's pet project, the library, and sports fields". I almost snapped my neck doing a double take when he said that! You will recall that at the budget meeting he stealthily snatched two-thirds of the money earmarked in the budget for the new library to be used for, among other things, replacing brand new median plantings on Mesa Verde Drive - the approach to his home! What a hypocrite! And an infantile one, at that! More on that in a minute. 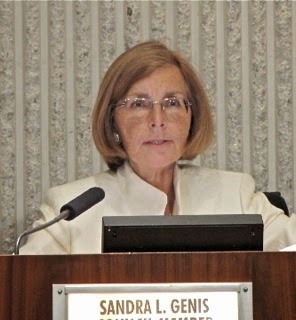 Sandra Genis mentioned the Orange County Fair, and encouraged folks to NOT park in nearby neighborhoods, but to use public transportation instead. She encouraged the staff to empty the CMPD sub station near Lions Park so the space can be used for a Veterans venue. She also mentioned Medical Marijuana, and seemed confident that NONE of the measures being circulated had a chance of appearing on the ballot. I thought that was curious because it's my impression that the City-sponsored measure that Duarte drafted didn't have to get signatures from residents - the council could just agree to place it on the ballot at their next meeting on August 5th. Guess we'll see. Wendy Leece made a long presentation covering many issues. Regarding Medical Marijuana, she said we shouldn't rush into it and, like the Charter, perhaps a committee should be formed to thoroughly study it and/or a study session should be held on the issue. She spoke about the Kaboom park creation, thanking all involved, including THINK Together, CarMax and others. She mentioned the community General Plan workshop at the Neighborhood Community Center. 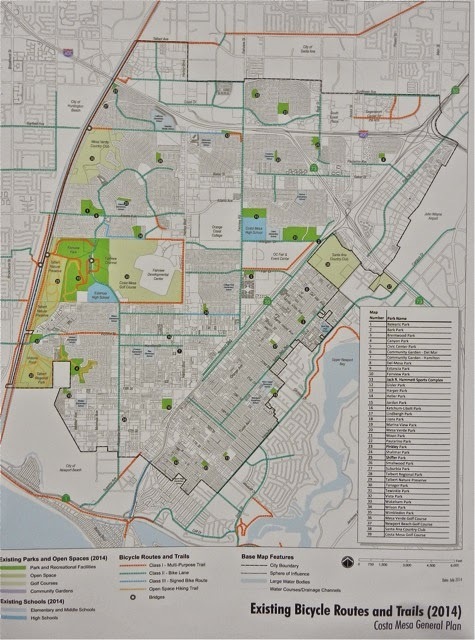 She also mentioned an article in the Orange County Register in which author Joel Kotkin refuted the desirability of the box-like developments that are popping up like mushrooms in Costa Mesa. Leece is back on the OC Vector Control Board after Mensinger asked to be removed from it and reported the appearance of Asian Tiger Mosquito. She asked "City Manager Hatch" - it always cracks me up when she refuses to use the haughty "CEO" title that has been bestowed upon Hatch by the two guys running the city these days - to provide information on Fireworks from the never-ending July 4th celebrations that lasted for almost two weeks in my neighborhood. Then she got to a very interesting subject. 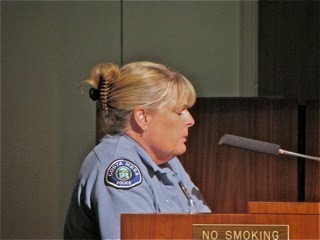 She reminded all that the contract with the Costa Mesa Police Association has expired as of June 30th, and that Mensinger and Righeimer cannot participate in negotiations with that group because of their bogus (my word) lawsuit, so it's up to Leece, Genis and Gary Monahan to convene and begin a plan for the negotiations. Apparently Monahan is dragging his feet and has not made himself available to meet with the others on this issue. I don't know, but I suspect that his reluctance is not schedule-related - it's purely political. And, if that's the case, in my view that is malfeasance on his part. Leece closed by addressing the concern of Teresa Drain about Mensinger's overstepping his authority by directing staff on the College Park Monument sign issue. She asked Hatch to send a memo to the council reminding them of the rules about direction of staff. 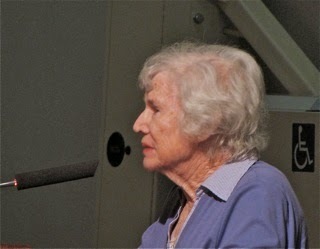 An observation - from the cheap seats in the back of the auditorium and not visible on the video feed I watched as Leece made her presentation and observed Mensinger, Monahan and Righeimer roll their eyes, share smirks and smiles as she addressed the ethical segments of her comments. That continued throughout the evening. 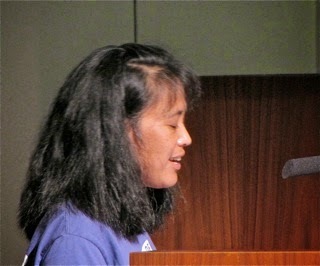 In fact, Mensinger and Righeimer frequently mocked her during the meeting. It was like watching a group of junior high school kids, for goodness sake! Sec. 2-106. Interference by council in administrative affairs. 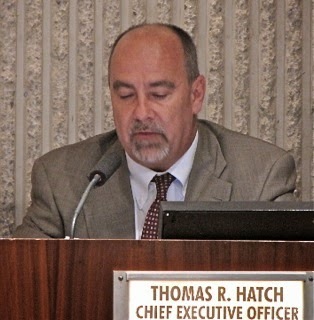 Hatch also talked about the success of the July 3rd Senior Center event - the first event conducted by the City staff after the hostile takeover of the Senior Center from the Costa Mesa Senior Corporation Board. That transition is not yet complete. He did say that more than 600 people have signed up as members - yours truly included. 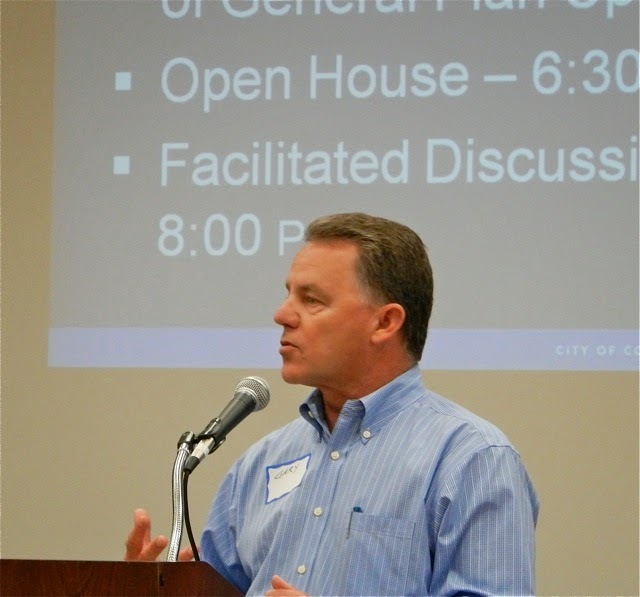 He also addressed the meeting that was being held simultaneously at OCC on their Master Plan, "Vision 2020", and how it might impact the City. It apparently involves more than 1 million square feet of new space, including a boutique hotel and student housing. Only one item was pulled from the Consent Calendar - #6. James Bridges pulled it, but left before the council considered it around 9:40 p.m., so it passed on a 5-0 vote at the very end of the meeting. Then Righeimer pulled a little shell game - that sleight-of-hand I referred to in the title of this entry. 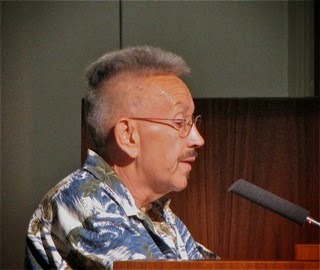 He pulled Public Hearing #4, the annexation of the Santa Ana/Colleen area, forward for the purpose of postponing it. 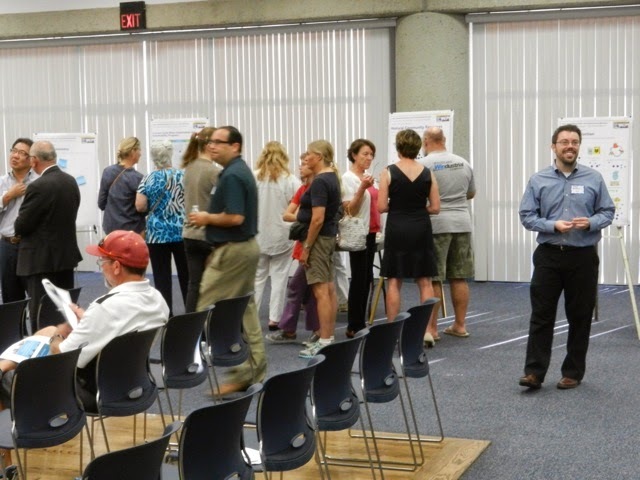 Seems he and Mensinger spent "a couple hours" meeting with residents who are concerned about the planned development in the middle of this area. He also met with the developers - some of the same folks who tried to buy the Fairgrounds - and he wants the City staff to broker a meeting between the two elements - the residents and developer - to see if they can find common ground. He asked that the issue be postponed to a date uncertain, then said "we've gotta get this done soon". Strange, since there's only one more meeting until after Labor Day because the council canceled the August 19th meeting. So, this issue will either be rushed and heard by the council on August 5th or not until September. 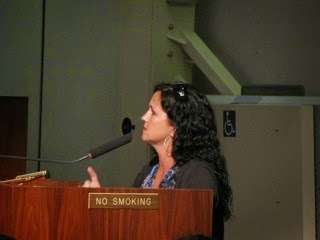 Then they addressed Public Hearing #1, the collection process for fines due the city for municipal code violations. The staff report, HERE, showed over $36,000 due, but that's been reduced to just over $27,000. Several people spoke to the issue, including one resident - Dave Balough - who appears on the list and told the council that a judge just threw the case out. The staff seemed surprised at that. The council passed the recommended action, 4-1, with Genis voting NO. They made short work of Public Hearing #2, the vacation of part of Superior Avenue for the pending development at the corner of Superior and 17th Street, HERE, on a 5-0 vote. Around 8:10 they began considering Public Hearing #3, HERE, the lot line adjustment involving church property on East 18th Street - not too far from my home. Neighbors have spent a lot of time on this issue, with lengthy reports provided by two of them for the council's consideration. It took about twenty minutes of conversation before they passed it on a 5-0 vote. The neighbors seemed happy. Gary Monahan, impatient with the process, moved the staff recommendation. 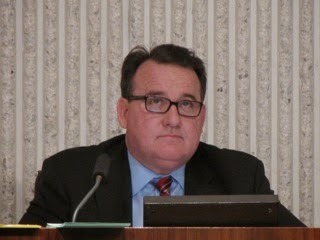 Leece tried to offer a substitute motion involving a moratorium but it was quashed by the City Attorney. 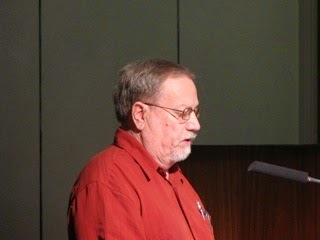 Leece, describing the plan as "mean-spirited" moved denial of the staff recommendation. It was rejected by the male majority, who then passed the staff recommendation on a 3-2 vote and motels throughout the city will feel even more pressure by Code Enforcement. Then, in maybe the best head-fake I've ever seen by a council, as the next item was being read into the record - Old Business #1, HERE, the change to the Municipal Code regarding fines for vandalism on private property - and the crowd from the previous issue was still filing out of the auditorium, Mensinger asked for a short break. What happened was that his break request was quietly denied and the process continued, although those of us left in the auditorium didn't know it because of the noise of departing residents. In less than 20 seconds they passed that item, 5-0! 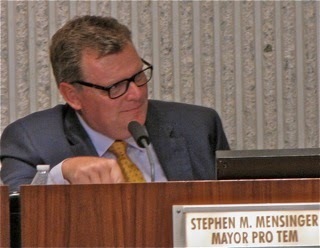 Then, equally as quickly, they moved rapidly to the final item on the agenda, Old Business #2, HERE, what I referred to as the "Shut your mouth-go away" ordinance and with less than two minutes consideration voted to codify the further infringement of your freedom of speech before the council, 4-1. Leece voted NO. 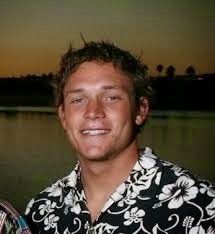 They gave short shrift to the only Consent Calendar item and at 9:40 the mayor adjourned the meeting in memory of Ben Carlson, the Newport Beach Lifeguard who died trying to rescue a man two weeks earlier, HERE.